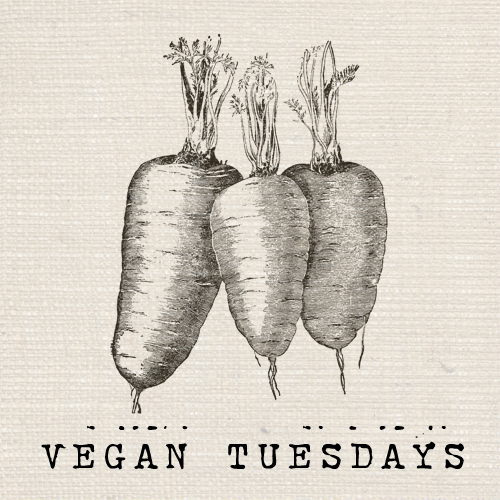 First things first, I’d like to introduce you to Vegan Tuesdays – a new weekly feature on The Fig Tree where I will document my journey to incorporate a lot more vegan dishes into my diet. I will be sharing my favourite vegan recipes, discovered vegan tips + tricks, and introduce new ingredients to inspire others. I am hoping to have a number of people guest post on The Fig Tree to help bring more variety to Vegan Tuesdays. My friend Destini at The Healthy Wife and I came up with the idea for Vegan Tuesdays back in July after I mentioned that I wanted to start eating vegan meals more regularly. I thought a good way to start would be to dedicate at least one full day a week to vegan cuisine. Similar to Meatless Mondays, Vegan Tuesdays would be dedicated to learning about vegan cooking techniques and using vegan ingredients as inspiration. As I am a vegetarian, Meatless Mondays are a bit lost on me. *hah* But, I am extremely excited to participate in Vegan Tuesdays and swap vegan dishes for my usual vegetarian fare. I follow a lot of wonderful vegan food blogs. I plan on looking to them for recipe inspiration and to learn tips + tricks related to vegan cooking. Some of my favourite vegan blogs include: Sunday Morning Banana Pancakes, Keepin It Kind, The Vegan Chickpea, and Vegan Fling. If you’ve not yet checked them out, please do so. These ladies are so very talented! I’ve also purchased a few vegan cookbooks including Veganomicon, Colour Me Vegan and Vegan Soul Kitchen to inspire Vegan Tuesdays. Since all of my meals are meatless, I know that adapting my meals to make them vegan will be relatively easy. But I would like my journey into eating more vegan meals and snacks not to be just personal. I want it to inspire others to try vegan dishes as well – to learn along with me. Plant-based diets are incredibly healthy and nutritious. And I think everyone could benefit with more vegetables, nuts, seeds, legumes etc in their diets. Variety is key when it comes to vegetarian and vegan cooking. There are so many wonderful ingredients to work with. As with vegetarian cooking, I want to show others that vegan cooking can be extremely flavourful, delicious and filling – and that meals do not have to revolve around animal products. Destini will also be contributing to Vegan Tuesdays on her wonderful blog. Actually, the extremely talented Destini designed our Vegan Tuesdays logo. I absolutely love it! :) Thanks Destini. I’ll be back tomorrow with the first Vegan Tuesday post. First up, a delicious Fresh Corn Farroto. It’s creamy like risotto, but uses fresh corn purée instead of butter, cream or cheese for its creamy texture. For added fibre and protein, farro is used in place of arborio rice. It’s a delicious recipe not to be missed and perfect to use up the last of the Fresh corn as the summer produce season ends. Hope you all have a fantastic weekend! :) I cannot believe how quickly this Labour Day Weekend flew by. Note: As mentioned on my “About” page, I am not looking to force anyone into a vegetarian or vegan diet. I’m just looking to inspire people to try different cuisines, cooking techniques and ingredients. Vegetarian and Vegan cooking is right for me, but may not be right for everyone. I do hope you’ll give some of the recipes a try. If anything, it’s a great way to incorporate new + exciting dishes into your weekly meal rotation. And better for your body and the environment too! so excited for your new feature!! I love this idea and can’t wait to see what you have in store! So excited for you! I’ve been vegan for almost 2 years now and LOVE IT. I feel better than EVER (I have allergies to dairy and eggs).. it was so hard at first. But now it’s easy and exciting to try so many new things all the time. yay! My blog is definitely not completely vegan, but I do enjoy vegan recipes every once in awhile! Are you still interested in having guest posts for Vegan Tuesdays? I thought I had seen something about it on your Facebook page recently. Thanks!